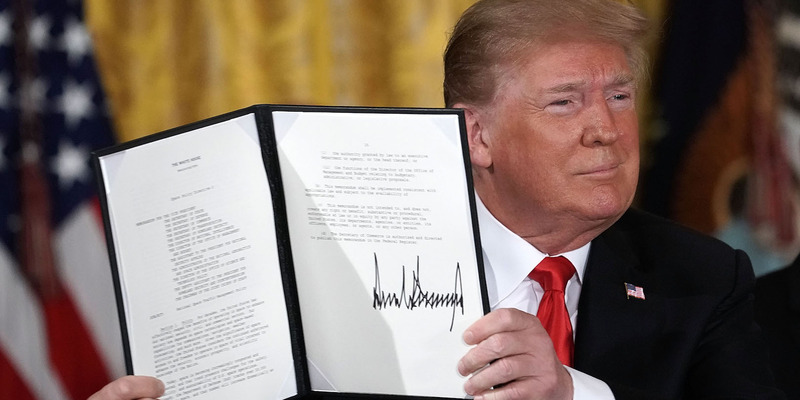 Alex Wong/Getty ImagesUS President Donald Trump signs an executive order to establish the Space Force. Rumours circulated this month that Air Force Secretary Heather Wilson had run afoul of the Trump administration over the creation of the Space Force. But Rep. Mike Rogers says his name was used as part of a “shot across the bow” to Wilson and that she has fallen into line. Rogers, a main proponent of the new force, says it’s needed to better work with private industry and to counter Russia and China. Rumours that President Donald Trump was considering firing Air Force Secretary Heather Wilson over resistance to the new Space Force were “a shot across the bow” to the service chief, according to Alabama Republican Rep. Mike Rogers, who has backed the new force. Several sources told Foreign Policy this month that Trump was weighing Wilson’s removal after the midterm elections in response to what the White House viewed as a campaign against the nascent Space Force, the creation of which Trump announced earlier this year. Purported resistance from Wilson – who wrote a memo in September saying the force would cost $US13 billion over its first five years – reportedly angered both Trump and Deputy Defence Secretary Patrick Shanahan, a former Boeing executive who is second in command at the Pentagon. 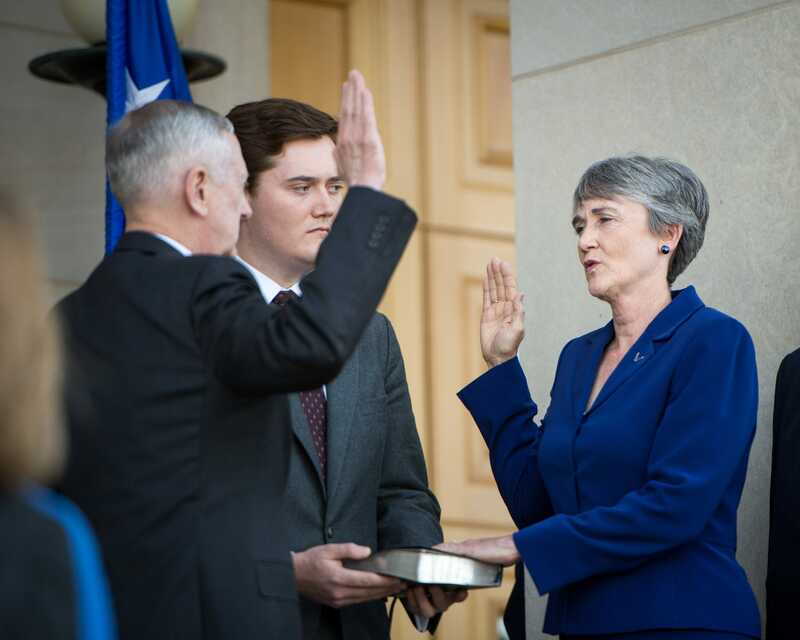 Defence Department/Wikimedia CommonsDefence Secretary Jim Mattis gives Air Force Secretary Heather Wilson the oath of office during her swearing-in ceremony. Wilson, an Air Force Academy graduate who served in Europe during the 1980s and was on the National Security Council staff under former President George H.W. Bush, was a Republican congresswoman from New Mexico from 1998 to 2009. The Trump administration picked her as Air Force secretary in January 2017, and she was confirmed by the Senate in May that year. But it was Trump’s June 2018 announcement that the Space Force would become the US’s sixth military branch that reportedly set Wilson at odds with the White House. The administration came to believe that Wilson was “trying to undermine this part of the president’s agenda from within,” a source told Foreign Policy. Rogers, who chairs the House Armed Services subcommittee on strategic forces, promoted the Space Force to Trump and his advisers for months prior to a March 2017 speech in which Trump said he was considering it. 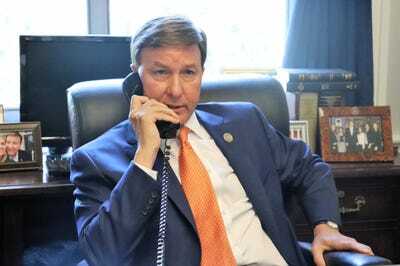 Rep. Mike Rogers/TwitterAlabama Republican Rep. Mike Rogers, July 18, 2018. In an interview with the Opelika-Auburn News published on Sunday, Rogers indicated he was involved in messaging to Wilson about the White House’s displeasure with her position on the Space Force. The Alabaman congressman, whose constituency includes Huntsville, which is home to NASA’s Marshall Space Flight Center, and research hubs like Auburn University, was mentioned as a potential replacement should Trump oust Wilson. But he told the Opelika-Auburn News he believed Wilson had gotten the message and was more supportive. Moreover, he told the president he believed he could do more to support the Space Force from Congress, where he aims to become chairman of the House Armed Services Committee. Rogers pushed the Space Force as a separate force because he believed the Air Force, which he says is largely run by pilots focused on Earth, would put little emphasis on space operations if the Space Force was added to that branch. He has also touted it as a way for the Pentagon to open a direct line to the private aerospace industry and keep pace with its work.